With only a few days left before Christmas, your house is sure to be decorated for the holidays with a style all your own. And hopefully you’ve kept safety in mind all the while. If not, here are a few things to consider this holiday season to make sure you and your family are cozy and safe. 1. 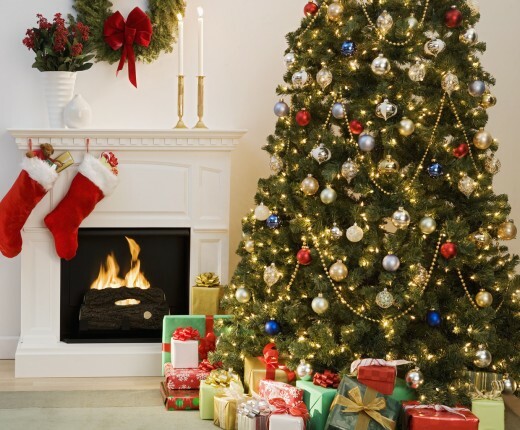 The center of it all – your Christmas tree: For you live Christmas tree lovers, keep your tree well-watered, and for those of you with artificial trees, make sure your lights are working properly because one in every three home Christmas tree fires is caused by electrical problems. 2. Powering up for the holidays: Don’t overload electrical outlets with too many extension cords, lights and other decorations, for this creates a real fire hazard. As a rule-of-thumb, use only 80% power on each outlet. To determine this, simply divide the watts of power you’re using by 120 volts, the number most houses are rated for, and you’ll know if you need to use more than one outlet. 3. Festive flames all a-glow: You also know that December is the peak time of year for home candle fires – especially on December 23, Christmas Eve and Christmas Day. Be sure you never leave a candle burning unattended and place them away from the tree and other decorations that could quickly spark a fire. An alternative is to invest in battery-operated flameless candles, which look real and are less of a fire hazard than open flames. However, keep the fire extinguisher in a convenient, easy-to-remember place, just in case. And while you have the ladder out for hanging lights, you should also change batteries in all the smoke detectors in your house. Tackling this task during holiday decorating not only saves time, it reminds you of the need to check smoke detectors once a year. 4. A potentially icy pathway: Outside, keep the sidewalks and driveway free of snow and ice with a shovel and snow blower. 5. 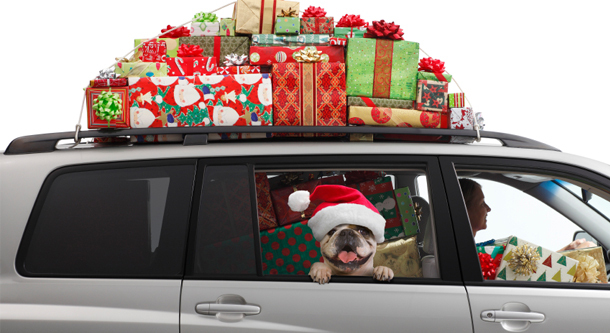 Hop in the car for your annual holiday road trip: Once your house is safe and beautiful, it’s time to prepare your car – and your family – for that special trip. In addition to dangerous weather conditions and limited daylight hours this time of year, traveling during the holidays has its own challenges that require extra planning. The entire family piles into a car, along with suitcases and gifts, which may make it difficult for the driver to see out the back window. Driving in unfamiliar areas can create yet another distraction. It may seem like a no-brainer to follow the above guidelines, but the holidays inevitably get somewhat crazy, so just take a little extra time this year and your family will thank you for it. If you have more questions about holiday precautions and the tools or equipment you may need, please get in touch with us via our contact us page or the comment section below. Happy Holidays! The majority of your outdoor equipment winterization should be done already, but now is the perfect time to begin home winterization. 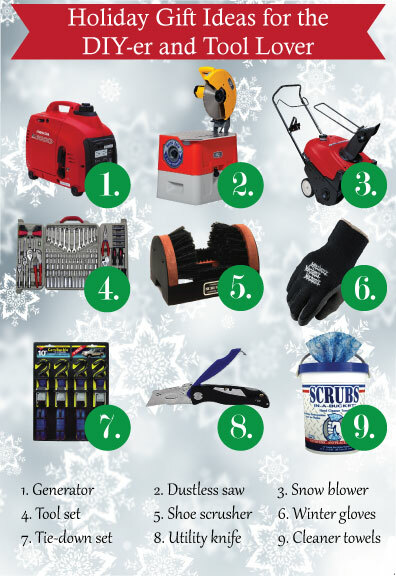 Below are eight relatively simple tips for sufficiently preparing your home for all that winter has in store! You’ll find what each task entails and then the tools needed to complete them – some require very little, which make for quick and easy projects. And this may be a no-brainer, but completing all these to-do’s will prepare your home for ice, snow, sleet and whatever else weather may bring. You’ll be glad you put in the extra elbow grease. Happy winterizing! The season of good cheer offers so many opportunities to bring family and friends together that do-it-yourself party planners are on the lookout for the best ways to spend less time planning and more time creating unforgettable memories. Here’s a list of decidedly hip ways to dazzle everyone on your guest list – including yourself! Planning last-minute is really not the same as impromptu party-making. Why? Not giving you enough time to prepare the house, the food, the music and the mood is seriously stressful! And not cool. Plan your party as one singular sensation that your guests will remember. Feature a favorite signature dish that you can prepare in advance, and pair it with an easy appetizer like roasted nuts and a sophisticated drink you create just for the event. Set the mood with a homemade mix of music, or choose one of the music channels on cable TV or the Internet. Dim the lights, light some candles and invite magic into the room along with the partygoers. 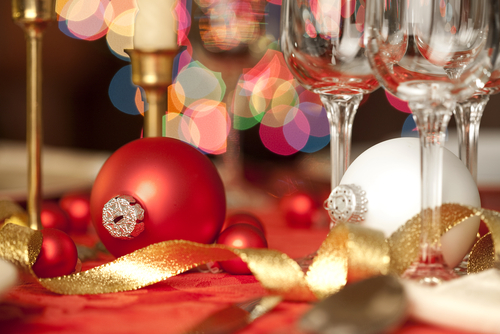 Speaking of singular sensations, party experts say one of this year’s most popular holiday looks is all-white décor. From decorations to wrapped presents to elegant displays of food (silver works well with white), the simplicity of one color wraps the evening up in style, is timeless and easy to create. Make your house party-ready by re-arranging the furniture to create places for mingling, intimate conversation, comfortable dining and even dancing. Rent a dolly to help with moving your furniture. Attractive tables and chairs are also available for rent, and assure enough seating for everyone. Rent a coat rack and hangers to avoid having guests pile coats and jackets on your bed. You can even rent china, glasses, serving dishes and silverware, saving your own from any accidental breaks. With the room in party mode, you can enjoy the company you’re with, instead of worrying if everyone is comfortable. And when it’s time to wind the party down, you can dole out leftovers in fun Chinese to-go boxes and call it a night. Most of the clean up and rental return can wait until morning. As the ultimate party planner Martha Stewart likes to say, “There’s no expiration date on glad tidings!” Avoid the strain of too many festivities in one month by choosing a special date in January to throw a party, when life is back to normal. Invite your friends and family over for brunch –to celebrate the start of a new year, or for an evening of movie-watching or game-playing, or to enjoy a potluck dinner. You can still make it a singular sensation, only planning the entire event may be more relaxed. And all of a sudden, you’ll have an event to look forward to – an unexpected present! Decorating your home and yard for the holidays is a festive neighborhood tradition that brings out the designer in all of us. In communities all over the country, so many families vie for “Best Holiday Lights Display” that they’re competing in a national competition on television. 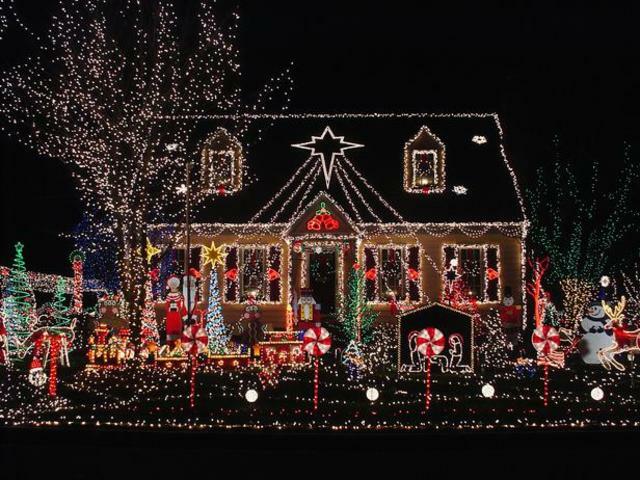 That’s right – just this week, ABC premiered a new series called The Great Christmas Light Fight, the first Christmas lights competition of its kind where 20 families transform their homes for the holidays and compete for a total of $250,000 in prizes. Holy Clark Griswold! The show airs through December 23, and will probably give you some fantastic ideas for decorating your own extravaganza. Create a Master Design. Break out the camera, some paper and pencil, and get to work. Taking a photograph of your yard from an appropriate distance can keep you focused on the overall look of the display. Choosing a focal point to anchor your design, whether it’s a unique architectural feature of the home or a winding path or the intricate branch patterns of a tree, and start designing from there. Consider including the backyard in your design this year, which you can also enjoy from inside your home. Use a tape measure to determine how many light strands you need, as well as, the distance to the power source. Experts recommend 100 lights for every 1-1/2 feet of tree or shrub you want to cover. The denser the lights, the brighter they shine, so look for light kits where the bulbs are spaced close together, or place two sets of lights side-by-side for the same effect. Choreograph your design using different colored lights to highlight different areas and have fun with the many types of lights available, such as icicles, blinking, LED, light nets and more. Safety First. This is a big one. Check the roof, shingles, gutters and other surfaces you’ll hang lights on for strength and flexibility. Decorate trees that do not touch power lines. Work with another person, and secure supplies to the ladder safely. Use UL approved extension cords and light kits for outdoor use, and follow manufacturer recommendations on the number of lights you can string together safely. Do not use lights that have frayed or damages cords, and test all lights before you hang them. Choose plastic light clips to easily secure lighting to gutters and other surfaces. Set a Timer. To save on energy bills, use an outdoor timer to turn lights off later in the evening. These days, timers also come with sensors that automatically turn on at dusk –especially nice when you’re away from home. Plan the Power Source. In addition to creating a master lighting design, planning the best way to access power for your display is key for safety. Experts suggest that outdoor lights be plugged into circuits protected by ground fault interrupters (GFCIs) that protect against shock. Power stakes are portable and bring the power to where you need it, instead of running too many extension cords all over the place. If you rent a generator, be sure to follow all manufacturer safety instructions, such as operating it outside, because carbon monoxide exhaust fumes can be fatal. Protect it from rain, snow and wind with a cover made from plywood and 2x4s. Follow state, local and national fire and electric codes and do not connect the generator directly into your home’s main fuse box or circuit panel because it might feed into the electric system and endanger any utility workers in the area. Check County noise ordinances if the generator is noisy, or choose one that’s quiet. Turn off the generator when away from home and while you sleep. With winter fast approaching, and December 21 the shortest day of the year, giving your home a little TLC can do wonders for your property value. There are three exterior improvements you can make to ensure happy holiday living: installing outdoor lights, spraying for pests and storing outdoor hoses. Each of these is easily accomplished and will help you mark another item off your fall checklist! An outdoor light timer is a convenient and efficient way to turn them on and off, especially when you’re not home. At the end of the day, the timer programs lights to turn on, and you won’t have to fumble for your house keys in the dark when you do get home. Later in the evening, the timer will automatically turn off the lights, saving you money on utility bills. Nowadays you can find timer devices for your outdoor lighting that screw right into the light socket. These timers have simple settings for programming the light switch. After you’ve set the timer, install it before screwing in the light bulb, keep the light switch on and you’re good to go. If you’re jones-ing for a more involved project, get out the screwdriver, voltage tester, wire stripper and electrical tape, and replace the ordinary light switch with a timer switch. When outdoor temperatures plummet, ants, spiders, crickets and other outdoor insects take shelter inside. 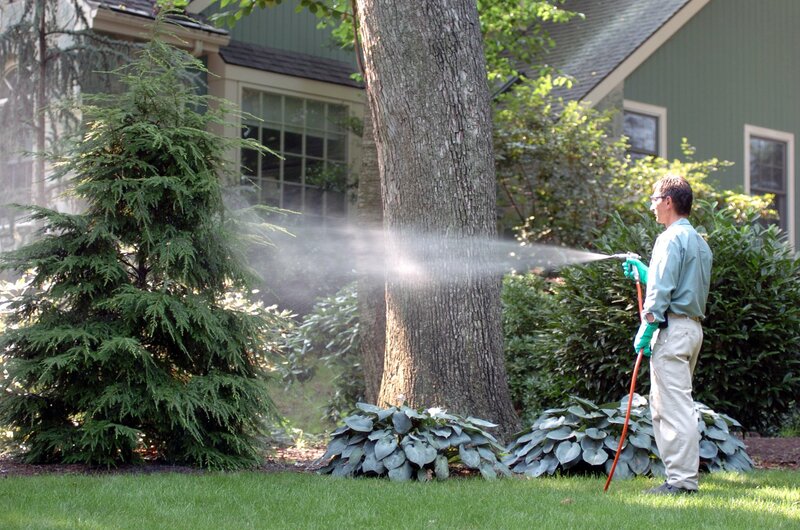 Homeowners can use indoor pesticides such as baits, dusts or sprays to keep pests at bay. But if you have youngsters living at home, the first defense is for a child’s safety, avoiding the use of pesticides inside the house whenever possible. A good alternative for indoor pesticides is to use a perimeter treatment on the outside foundation of your house. Perimeter treatments form a barrier on exterior surfaces, which stop pests from entering in the first place. For a perimeter treatment to be effective, get it in place before insects start entering the house or garage. You may prefer to hire a local exterminator to get this job done. However, it’s also on the to-do list of most do-it-yourselfers. After you finish using hoses for the season, drain them of water. Turn off the water at the spout, then either use the spray nozzle or hold the hose vertical until every drop trickles out. It’s also a good idea to disconnect hoses from waterspouts, and then protect them with inexpensive foam spout insulators. 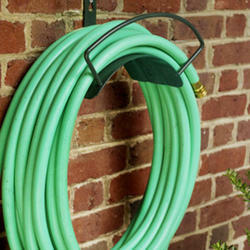 Storage for garden hoses comes in three basic types: racks, reels and pots. Racks: the space-saving, and often decorative, rack hangs on the wall and keeps hoses off the ground. Hoses are coiled around it by hand, but can be taken off and brought inside for the winter. Reels: with reel-type storage, turning a crank handle easily coils the hose up, and it keeps the gardener less dirty. These practical units also have wheels to move around the yard with ease, or into the garage for the winter. Pots: garden hose pots need to come with drainage holes and are a good option if they’re kept near a watering area. Pots can also be transported to a storage area for the winter.